We are live here on Christmas Eve from the Faraway Pillow News Desk interrupting your scheduled internet browsing for a breaking report... we've received credible reports that he has packed up his sleigh, fattened up his eight tiny reindeer, and has made the final preparations for his flight around the world. Stay tuned as this story develops. Faraway Pillow News aims to keep you informed as we follow the world’s most travelled man, Santa. Breaking News: St. Nicholas has been spotted high above the summer skies of Sydney, Australia. It’s near 100 degrees Fahrenheit and Christmas dinner is being served on Bondi beach. The feast includes turkey, ham and Christmas pudding with a gold nugget hidden inside…watch out! While a surfboard and surf shorts might be more appropriate for Santa here, he does the job in his big red suit. Christmas is a magical time and Santa, a symbol of the season, brings joy and wonder to millions of children around the world. This time of year brings out the inner child in all of us... if we allow ourselves to believe. We've just heard from our collaborators in Tokyo that Santa has just arrived in Japan where he is referred to as Hoteiosto, an old priest with eyes in the back of his head. Children are advised to be good when he comes around. While Santa is reported to have had a hankering for sushi and udon he ended up with turkey for dinner, an American custom adopted by the Japanese. Some say Santa isn't real because they haven’t seen reindeer fly, can’t conceive how a man (whose belly shakes like a bowl full of jelly) could squeeze down a chimney, don’t understand how one man can travel the globe in a mere night. Seeing isn't believing, believing is seeing. Have you ever seen a million dollars? Just because you haven't seen it, doesn't mean it doesn't exist. Magic is all around us. I believe. Do you? We’ve just received word that Santa has arrived in Sweden, where he goes by Tomte, a gnome who comes out from under the house with a sack full of gifts for good little children. He eats bowls of porridge left out for him by the family. Reindeer are originally from Scandinavia, so Rudolph feels right at home! Now, messages from our sponsors: Milk and cookies... monopolizing Santa's Christmas Eve treat for generations! 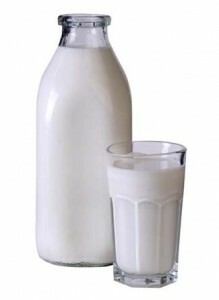 Milk… does a body good. We're back and this story is rapidly developing! Santa has been seen gliding over the Eiffel Tower in Paris. Père Noël has left presents in the shoes of les bon enfants and has had the Christmas fare of oysters, fois gras and bouche de noel (Christmas cake). Not only is Santa the world’s most traveled man, he’s an epicurean. Paris was definitely the right place to go for dinner! Food is an important part of noel celebrations. No matter your country, customs, or family, food is always part of the festivities. In my house we wake up to the cinnamon scent of Monkey Bread baking in the oven. Food creates memories...think back to your childhood; food no doubt has a premier spot in your yuletide traditions. Folks, this just in…Santa has been seen over South Africa where children have hung their stockings for Father Christmas. The windows of houses are decorated with sparkling cotton wool and tinsel to look like snow, regardless that it is summer! Guess they were dreaming of a white Christmas. We've got an update for you folks! 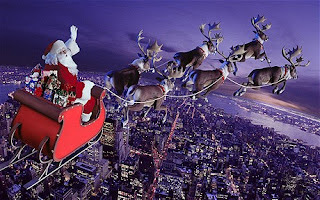 Santa has been spotted in Brazil where he is called Papa Noel. He puts presents in children’s shoes and hides other presents all around the house. When children wake up they search for the hidden gifts only after they serve their parents breakfast in bed! Reportedly, Santa almost crashed into the 275 foot Christmas tree that floats in Rio de Janeiro’s Rodrigo de Freitas Lagoon! Papa Noel, Babbo Natale, Father Christmas, Ded Moroz, Kris Kringle, Sinterklaas, Agios Vassilios...though he has many names, Santa Claus embodies the spirit of giving, kindness, and love around the world. Christmastime briefly transforms mankind, which is naturally selfish and cynical, and like a sparkling Christmas bulb, shines a ray of altruism and hope across a seemingly dark winter night. You heard it here first… Santa has entered American airspace! Quick, boys and girls get to bed, put out milk and cookies for Old St. Nick and don’t forget carrots for the reindeer. As travelers we can really appreciate Santa’s magic. He goes to all 192 countries and visits each and every home that celebrates Christmas. He transcends languages, cultures, and time zones. Santa, if you’re tuned in to our program… for Christmas I want one round-the-world ride in your sleigh... no customs/immigration queues, no annoying airport announcers, no long security lines, no airline meal mystery meat! No matter your beliefs or customs, the magic of Christmas is abound. People come together to celebrate; the traditions are varied, the cuisine is diverse, but one thing unites us; the spirit of forgiveness, reconciliation, generosity, and love. Merry Christmas to all and to all a goodnight!